What if the emptiness we feel is a sign of our potential? I spoke last week at Indian Field Campground. Indian Field is a Methodist “camp meeting,” which was established in the early 1800’s. Participating in the rich tradition of this revivalist gathering was incredibly fun. The narrative of the wedding of Cana is fascinating on many levels, but the six stone jars used by Jesus have always intrigued me. 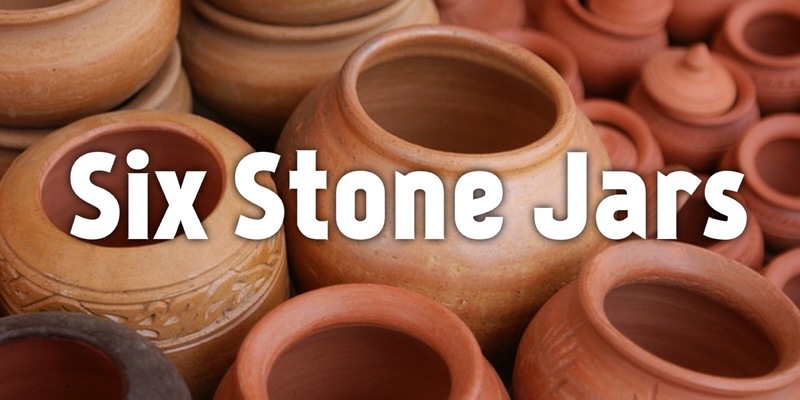 The six stone jars were originally used for the ritual of purification. The host provided six stone jars for his guests to “purify” themselves as they arrived for the celebration. Many of these guests would have likely walked considerable distances. Their hands and their feet would have been dirty from their travels. The jars were made available for the cleansing of hands (and feet). More than a hygienic act, these men and women would “purify” themselves to they could participate in the celebration and share in the meal. The choice of Jesus to work within these “old vessels” should provide a sense of hope, because this action affirms the will of God to do “new things” inside of “old vessels” through Jesus Christ. “Old vessels” are still capable of vitality, relevance, and effectiveness! Jesus instructs the stewards to “fill the jars with water.” (John 2:7) But, why? Honestly, how cool would it be if there was not a need to fill the jars! Imagine the implications of this story if the jars were full of dirty, unclean water tainted by the dust stained hands and feet of the guests. Imagine the implications of this story if Jesus had turned that water into the choicest wine. But, the jars were not full of this water. I’ve always been fascinated with these six stone jars because I believe they represent the Old Covenant, but the morning I was to deliver a message on this scripture I realized these stone jars also reflect me. They reflect you. They reflect everyone, who has ever felt empty or hollow. The average person carries around a staggering amount of burdens. Their heart is full of guilt, shame, grief, pain, resentment, regret, etc. The great irony is the more burdens we carry within our hearts the more empty we feel! Maybe the first sign is also hopeful because the story addresses an emptiness too commonly known. Jesus does not disregard these six stone jars because they were empty; rather, Jesus looked upon them and saw the potential they contained. Jesus believed these jars could reveal the glory of God. Jesus did order the servants to fill these jars because they were empty. Jesus ordered them to be filled because they contained potential. While God creates out of nothing, God can also create the new, the beautiful, the glorious inside of the old when Jesus fills it to the brim. My friends, I know how it feels to be empty inside. Our emptiness – that hollow feeling – may signify the great multitude of our burdens; but, our it does not have to define us. Our today does not have to be our tomorrow. Jesus did not disregard the jars, neither will he disregard you and me. The emptiness you feel is the potential Jesus sees – God can create the new inside of the old when Jesus fills it. Blessings to all! And, please feel free to comment or to share with others. This entry was posted in Weekly Messages and tagged #anxiety, #Christianity, #depression, #emptiness, #God, #inspiration, #psychology, #united methodist church by SkippingStones. Bookmark the permalink. Awesome !! Thanks for sharing this wonderful insight into a familiar passage that’s always yields something new each time its read! !